Lost in Time – thé exciting location based iPad game – is now available in the App store! Help us to expand further throughout The Netherlands and beyond! What is Lost in Time? Lost in Time is a game for the iPad played while walking across town. This way you’ll get to know the city and her stories, and the related and beautiful unique places. It is an engaging game that combines high quality video imagery and exciting gameplay with a real life quest in the city and through time. During the game the player is guided by one of the most famous comedians in The Netherlands: Freek de Jonge. Lost in Time has been released in a ready to sell version, has been thoroughly tested and is available in the App store since March 2013 (city of Utrecht) and May 2013 (city of Amersfoort). The second half of 2013 has been dominated by the first customers (players and clients), and by a number of improvements and changes that have made the game and our organization even better. Due to lack of marketing budget we have not been able to properly introduce Lost in Time to the market. We have learned a lot however and are now fully ready to make Lost in Time a great success. In the first half of 2014, we’ll expand to Amsterdam, make an English version and we strive for an iPhone version (depending on cost and potential). We sell Lost in Time in two ways, which influence and reinforce each other. On the one hand, we generate revenue from paying players, but we also sell a place (additional content) in Lost in Time to local parties who want to tell their stories. They can thus interest new, younger generations who experience the world more and more in interaction with their (mobile) device. Clients can also have their own game in a region with their own stories and information. An example is ‘Lost in Time aan de Eem’ (Lost in Time by the Eem river), which will be released soon and was fully commissioned by a Heritage Foundation. What will we use your money for? We are going to expand Lost in Time to Amsterdam, the place in The Netherlands with the biggest potential in terms of tourists and visitors. Thanks to our experiences in Utrecht and Amersfoort, the game is now very well suited for a large market. We’ll make an English version of the game so the number of potential customers (tourists) greatly increases. We set up a solid partnership in Amsterdam with a number of rental outlets so that we can serve the tourists. We update the marketing plan with our agency (EPIC Amsterdam) and execute it with a hired marketing professional. Anyone who is potentially interested in Lost in Time should know that it exists (target groups and tourists, sightseers and business trips). Our marketing will focus primarily on online (social) media, PR and free publicity. We’ll also create a new website. We're doing a pilot with several event organizers to develop a “Lost in Time for Groups”. The formal settlement to actually receive the € 40.000 took much longer than planned and promised to investors. In the original plan in 2012 we wanted to spend the money raised via Symbid on the national roll out to 24 cities. We’ve now concluded that we first want to concentrate on a good introduction in Utrecht and Amersfoort (already existing) and Amsterdam (new). We are also developing an English version for Amsterdam. Only after these three cities are successful, we’ll spend time and money on the expansion to other cities in The Netherlands and abroad. We finally came to the conclusion that the financial information estimated from 2012 in our original plan and not realistic (revenues,cost and efficiency). We think it’s very important that anyone deciding to invest in Lost in Time does so based on the most updated and latest information.We’re therefore pitching Lost in Time again, both to existing and new investors. Below you can read all about the updated plan, including our new financial expectations. We have incorporated all the lessons we have learned in the past year. You may also invest if you haven’t invested during the first campaign! What is Lost in Time and who are our partners? Lost in Time is a location-based game for the iPad that brings to life the stories associated with cultural heritage, history, buildings and places in thecity. These stories are an adventure you can experience through exciting gameplay, credible, compelling footage and the technical capabilities of the iPad itself. Lost in Time begins with an exciting introduction movie that turns your iPad into a time machine. You are asked to restore history, which has been changed by a boy who travels through time. You can play the game in different cities in the Netherlands (currently Utrecht and Amersfoort, Amsterdam in development). As soon as you take the iPad into the chosen playing area, a number of icons appear on the map. These are time portals, where you can travel back into history and get to know a story from the past linked to that specific location. A person calls out to you to help him and your actions determine the course of history. Besides time portals, there are also other locations to be found: places that are related to historical figures or events, or places where you play a mini game to learn more about a specific building. For screen captures and for more articles about Lost in Time, please see the uploads in the media section. To be able to roll out Lost in Time across The Netherlands, a basic version of the game has been developed, covering four generic storylines in Dutch history. This way we can quickly deploy the game to cities with similar historical - Medieval – city centres (cities like Delft, Leiden, Deventer, Den Bosch,etc. in The Netherlands but also cities abroad like Antwerp, Ghent, Brussels, Cologne,etc.). In each city, extra content will be added to the game with a local partner, so the game remains interesting for existing and new players. This extra content also generates new PR opportunities. The local parties add to the expansion of the game with both content and capital (see below). The ambition for 2014 is to expand the game to Amsterdam (in both Dutch and English versions) in the first half of the year, and 12 other cities in the second half of the year (the cities with the most tourism potential). There are more opportunities for expansion that we are investigating, like an iPhone version, expansion to other platforms such as Android and multiplayer options. You’ll invest in the exploitation of the game Lost in Time and all its variants and special versions that we can produce with the same storyline (the timetravel game with Freek de Jonge in the lead). We structure this in a separate Lost in Time BV (which will be a daughter company of Tempeest). Who produced Lost in Time? Lost in Time is a game of Tempeest, a creative company that has emerged as a partnership between different creative companies.The cooperative (present legal entity of the Tempeest company) is a model that is extensively being promoted in the creative industry right now. Tempeest is often referred to as “good practice” of this initiative by, for example, CLICK and other stakeholders in the Top Sector Creative Industries (government backed platform for the creative industry in The Netherlands). At present, Tempeest has five shareholders /founders. There is a core team of three people (Danny van der Voorden - CEO,Peter Dubois - content director, Karen Sikkema - business developer) who work for Tempeest / Lost in Time on an on-going basis and also a number of creative workers who work on a project basis (Michiel van Eunen - game development,Jonas Klinkenbijl – film maker, Joris van Liempd – software). Additionally,there is currently a marketing agency actively involved in Tempeest (Amsterdam-basedEPIC) and there will be a marketing employee hired in short term. Lost in Time was one of the contestants in the Living Labs Global Award and was assessed by the city of Barcelona as scoring 4.0 out of 5.0 on International Market Potential. This led to an invitation from Barcelona to come and pitch Lost in Time as an innovative tourist application. Lost in Time was one of five finalists in the Dutch Creative Business Cup 2012 and was described by the jury as “A major contender. The product is very well made, it is well thought out. It can only get better and there is definitely a place for in the market." Tempeest won the UtrechtInc ThumbsUp award. The world around us is changing rapidly. New generations become more and more accustomed to a constant availability of media, information and knowledge and, most importantly, they use these media in a different way than older generations were used to. One of the main changes is the shift of LEAN BACK media to LEAN FORWARD media. Anyone older than 30 years, has grown up with media that could only be used in one way: in short, leaning backwards. That is: the media (radio, newspaper, television) are transmitting, and the users can only receive. Younger generations use media in a totally different way. Only receiving messages is not an option for them, they are used to interact, to talk back and to discover: through the Internet, games, Apps etc. Much of the available media and communication from companies, institutions, organizations and others is currently not well equipped for this generation of users. The image that younger generations have of museums or heritage sites is that you can only do one thing: SEE something. No interaction is experienced with the environment and it’s impossible to learn or discover through DOING. A place where only one verb prevails ('TO SEE') is no longer adequate. Older generations - parents,decision makers in government, education, business, cultural heritage - often find it difficult to find ways to respond to these changing media needs. The rise of mobile hardware makes interaction with the surroundings, doing and exploring a possibility for everybody, also on location. Many apps are responding to theneeds of visitors and tourists by supplying information on the surroundings;the apps with tourist information, tours and area information are rapidly emerging.But most of these apps are not much more than a digital tourist guide. They are developed from the broadcaster-receiver paradigm and do not offer interactive content or a complete visitor experience. There is a need for quality contentand valuable experiences, especially for the LEAN FORWARD generations but also for their parents, grandparents, colleagues, family and friends. Lost in Time is the response to that need. For whom? The market for Lost in Time - and our business model - is twofold. On the one hand, we generate revenue by paid downloads of Lost in Time in the App store or by iPad rentals with the game installed at resellers. On the other hand, we offer local partners (museums,local historical foundations, heritage parties and communities, but also entrepreneurs and hospitality venues located in a historic building in the playing area) an opportunity to be part of the game. On different levels, they can add their own stories or information to the game. These two markets reinforce eachother and together will make Lost in Time better and more profitable. In 2013 we gained a lot of experience with different types of players: families, corporate outings, groups of friends. They downloaded the game from the Appstore or played it through one of our distribution points (tourist office,lunchroom and through our own employees). We continue to market these groups through our partners with whom we work together (such as ticket offices, distribution points and event agencies). Lost in Time is a unique experience that attracts players from both the leisureand recreation market as well as from from the gaming market. The market forleisure and recreation (events, city tours, family outings) in The Netherlandsis very large: in our country in 2011, more than € 37 billion was spent onleisure activities outdoors. The target groups for Lost in Time are families,sightseers / tourists and groups (such as corporate events and family celebrations). Social Media: Facebook, Twitter and relevant actions / promotions on these channels and other online communications, such as ads on relevant sites like “dagjeweg.nl” (website that collects and rates day trips and outings). The recommended retail price for resellers / distribution points in the city is €17,95 including iPad rental. €7,42 of every purchase / rental goes to Tempeest. iPads are rented or purchased by the distribution points themselves. Groups can buy the game at selected event agencies that offer Lost in Time to their customers in license. The agencies buy iPads and for each game played, a €10.00 fee is paid to Tempeest. Lost in Time offers parties such as local museums and historicalfoundations, preferably in cooperation with city marketeers of municipalities,a new platform to tell their stories and to be visible for a new audience. The optionsfor these parties vary from producing a completely new Lost in Time edition ona particular location (costs for the client are between €50.000 and €80.000) toa small game based on archive footage (cost an average €6.000) or a mention inthe game at a specific location (costs up to €1.000 per year). We reach these parties through our own (extended) network, throughpartners such as Itrovator and Immovator, through relevant media and throughpresentations at relevant meetings such as Games & Heritage, CLICK(Topsector Creative Industries), cross-media café, etcetera. €120.000 came from an innovation subsidy from Agentschap NL (Ministry of Economic Affairs). This money was used to develop the first prototype of Lost in Time, and for programming the final version. €20.000 was invested by a local partner as a contribution to the development of the pilot game. The five founders of Tempeest invested the remainder in unpaid hours (more than 10.000 hours in total). In addition, the five founders lent a total of € 24,000 to Tempeest to be repaid at the end of 2014 (only if cash flow and company situation allows for this). Lost in Time went live in the App store during the first half of 2013. In2013 we earned almost €60.000 in revenues generated by Lost in Time, mainly bycreating a special Lost in Time version for a heritage foundation. Consumersales (by downloading or iPad rental) generated almost € 2.000 of revenues. Thenet result in 2013 was -/-€7.895. At this moment, we have more than €11.000 in our bank account. In the firstquarter of 2014, we do not expect additional revenues from Lost in Time but wedo want to invest in marketing and improvements in Lost in Time (expansion toAmsterdam, English version). In the second quarter, we expect to generate a positivecash flow. The money from Symbid is used to bridge the negative cash flow forthe first quarter. There is a separate investment plan available describing how the €40.000 investment through Symbid will be spent. The money is not spent on salaries andother running costs. The B2B sales are based on the experience so far in this specific market. In 2013 we made one dedicated Lost in Time version; in 2014 we expect to do four with a rise to 6 in 2015. The first channel is the iPad rentals to tourists and day-trippers. We based our revenue forecast for 2014 on a detailed rollout plan for 12 cities (after Amsterdam, Utrecht and Amersfoort) and the number of tourists and day-trippers to those cities. We know how many tourists take a canal tour in Amsterdam and we use the assumption that Lost in Time appeals to the same needs (you see something of the city and it takes about 2 to 3 hours). We assume that 1 in 200 of those tourists will play Lost in Time. We take into account seasonality and a sales maturity model. We are very dependent on successful partnerships with distributors. The recommended consumer price (€17,95 inclusive of VAT, per rental) has yet to be validated, although the (limited) experience in 2013 with this price level is good. The second channel is the direct downloads in the App store. We assume that we can just get into the top 150 most popular downloads in Netherlands. For the iPad that means around 150 downloads per month. Adding an iPhone version in the second half of the year, generates more downloads (about 1.700 per month) because more iPhones are being used. The number of downloads and the price level (an average of €7 consumer price per download) have yet to prove successful in practice. There are specific costs included for product development (including iPhone and Android) which are estimated as accurately as possible, based on our experience. For the realization of B2B projects, we expect a margin similar to the project that was completed in 2013. The operating costs are based on current costs, with a small increase due to inflation. Currently, three of the five founders are actively working on Lost in Time. Two of them get a salary at market level. However, this salary will only be paid if there is sufficient positive cash flow and no debts. One of them (the CEO) will not be paid a salary in 2014, although mandatory social security and payroll tax will be paid. Please note that the founders have already spent 10.000 hours without pay to develop Lost in Time. Lost in Time has been developed by Tempeest, but will now be marketed by a separate Lost in Time BV. In order to use the software, Lost in Time BV pays a fee of 10 % of the turnover generated by the product. Again, this only has to be paid when there is a sufficient positive cash flow. 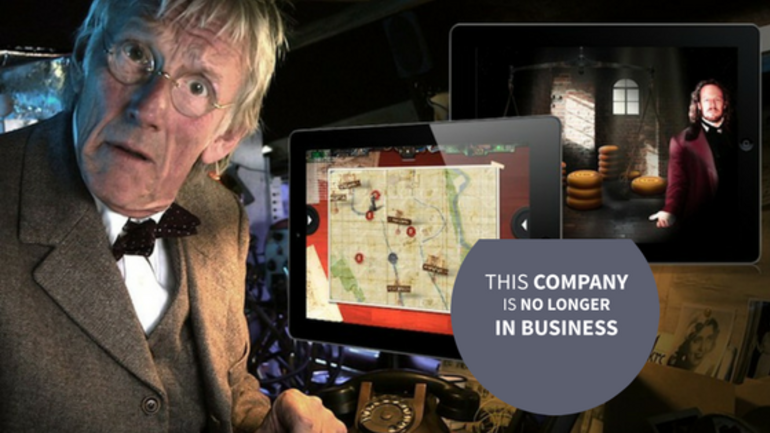 The Symbid investors become a shareholder of the new Lost in Time BV. The summarized P&L for the coming years can be downloaded from the finance section (on the right). In the financial section of our offer, the Equidam report can also bedownloaded with a valuation of Lost in Time. The average valuation in this report is €937,158. We offer 6% of the shares for an amount of € 40,000 giving atotal valuation of €666,666. This is equal to our earlier Symbid campaign and means a 29% discount to the Symbid investors compared to the Equidam valuation.